Musicians on Call supporter Amos Lee will tour the U.S. this fall in support of his fifth studio album, Mountains Of Sorrow, Rivers Of Song, which will be released on October 8 by Blue Note Records. The headline run will kick off on November 5 at Riverside Theatre in Milwaukee, and Amos will donate $1 from each ticket sold during the fall tour to Musicians on Call. Amos has been part of the Musicians On Call family for many years. He’s an ongoing volunteer at their WXPN Musicians On Call Bedside Performance Programs in Philadelphia, has inaugurated their Bedside Performance Program at the Philadelphia Veterans Community Living Center, performed a benefit concert in NY, and shared his MOC experience on CNN in order to raise awareness of their mission. 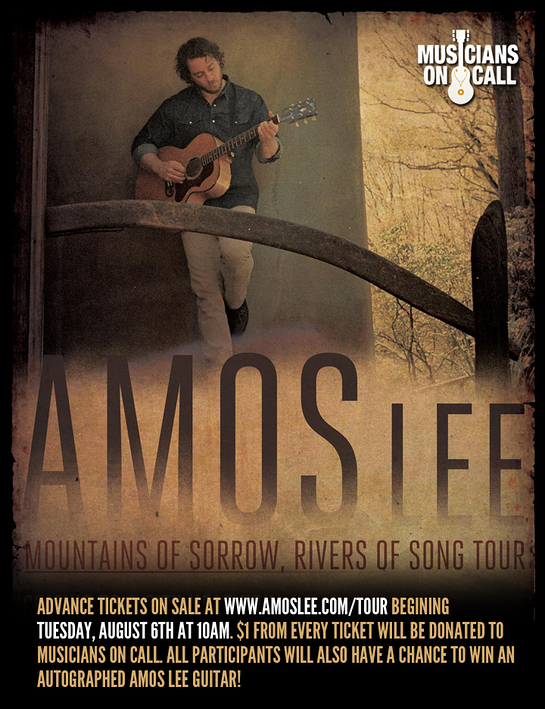 Tickets for the Mountains of Sorrow, Rivers of Song tour went on-sale on Tuesday, August 6th at 10 AM, and are available for the first time directly on Amos Lee’s website. If you decide to make an additional donation to Musicians On Call when purchasing your tickets, you will be automatically entered into a contest to win an Epiphone Vintage Starburst PR-150 Guitar autographed by Amos Lee! Click HERE to purchase tickets.